The diagram below is what many textbooks show. 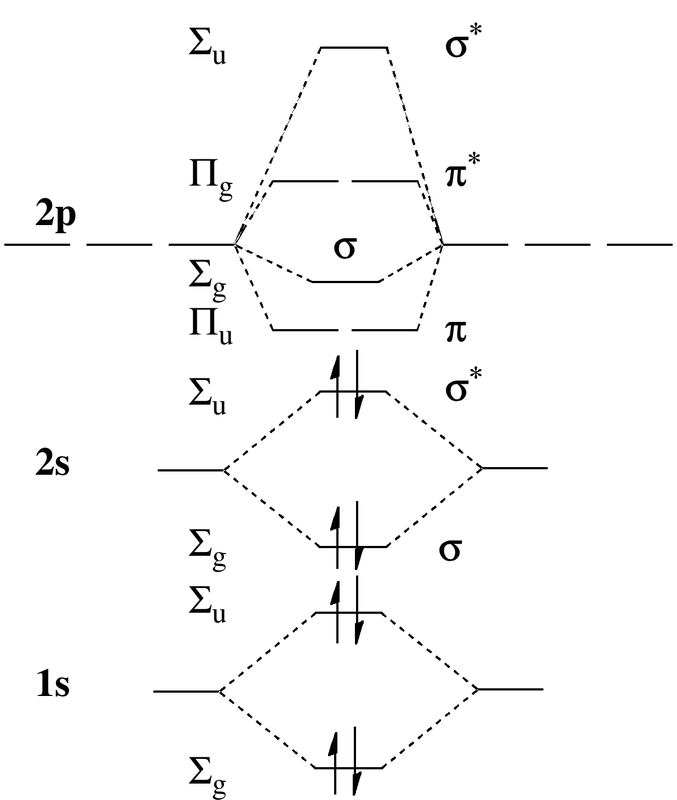 The diagram can vary (and hence confuse) slightly, in regard to the relative ordering of the σ and π energy levels originating from the overlap of the 2p orbitals. It depends on the atom, and for Be, the σ comes out higher than the π. The other key ordering is that the σ* antibonding orbital resulting from out of phase overlap of the two 2s orbitals is actually lower in energy than the π bonding orbital resulting from in-phase overlap of the 2p orbitals. Yes, an antibonding orbital is more stable than a bonding orbital! Well, the diagram shows that the pair of occupied molecular orbitals resulting from the two (symmetric and antisymmetric, or g and u) combinations of the 1s orbitals cancel each other, as do the 2s combinations, and we conclude the bond order for this molecule is zero! Actually, if a quantum mechanical calculation is performed (at the ωB97XD/6-311G(d,p) level), the bond length emerges as 2.81Å and a vibrational wavenumber of 167 cm-1 is predicted. Despite the zero bond order, a weak bond IS predicted, and this is the van der Waals or dispersion bond. Let us now pump this molecule up to a higher energy state by a double excitation of the two electrons in the 2s σ* electrons. We have to split them up, one each, into the next available orbital, which is the π, to form a triplet state (just like di-oxygen). Well, this (higher energy) state is certainly shorter (a contrast with my item on longer being stronger). The length is now 1.78Å, which is more than 1Å shorter than the original state, despite being ~ 45 kcal/mol higher in energy. The Be-Be stretching wavenumber goes up to 917 cm-1. With four electrons in bonding orbitals, diberyllium has a double bond! One can also pair the π electrons up to form an open shell (excited) singlet, which is ~ 51 kcal/mol higher than the closed shell (unbonded) singlet. This also has a length of 1.78Å and a marginally lower stretch of 909 cm-1. Read more about the doubly excited state of this molecule. One might be tempted to make an analogy between physics, and its particles and antiparticles. Yes, electrons can occupy antibonding as well as bonding orbitals. But the overall bond order will be reduced to zero if the total numbers of each are equal. And one can be pretty certain that there is no molecule at all in which the number of antibonding electrons exceeds the bonding ones! Or, if anyone is aware of such an example, do tell! This entry was posted on Friday, January 21st, 2011 at 12:30 pm and is filed under Interesting chemistry. You can follow any responses to this entry through the RSS 2.0 feed. You can leave a response, or trackback from your own site. A fascinating example, Henry! Thank you for the entertaining and educational post which I read with much interest. The only change that I would make in the MO diagram is the amount of splitting for the 1s orbitals. They do not interact strongly and the resulting MOs stay much closer to being degenerate. Thanks Igor. Yes, I dare say the diagram could be made more quantitative. But re-reading it, I note also that I describe the singlet Be-Be molecule as having a dispersion bond. Schreiner has recently come up with a spectacular example of such (doi: 10.1021/ja302258q) in which a C…C “bond” of around 4Å has a dissociation energy of around 20 kcal/mol. It looks as if the dispersion bond has now properly entered the gallery of bond types! Inspecting the diagram above, I achieved Be-Be bonding by double excitation into a π orbital, forming a triplet. An even easier way of achieving bonding is by removing two electrons completely. 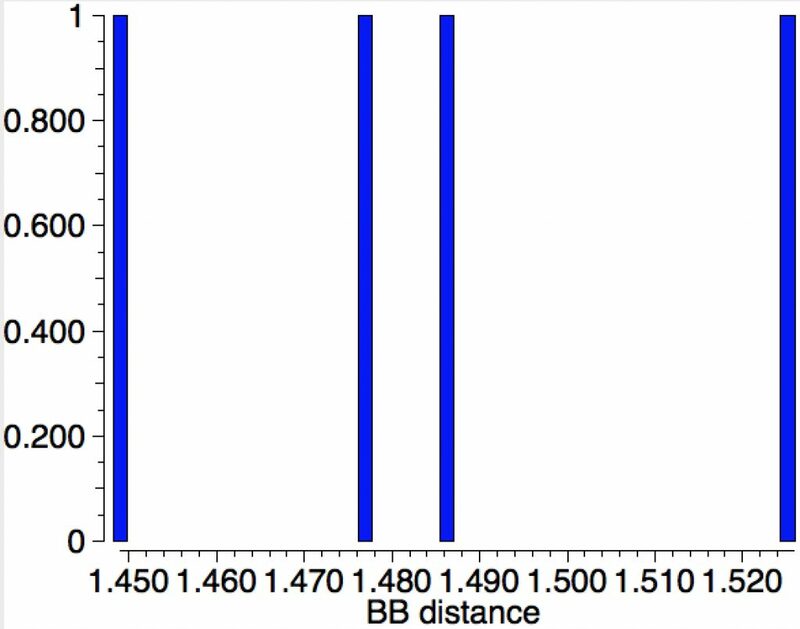 This can be achieved with the help of ligands and N-heterocyclic carbenes are one such (DOI: 10.1039/C3DT50563D, 10.1002/anie.201609455) with Be-Be distances of ~1.945 Å. A ωB97XD/6-311G(d,p) calculation on Be22+ indicates it should have a Be-Be bond length of 2.13Å (ν 653 cm-1). This is clearly bonding, but longer/weaker than the triplet state noted above. This latter has additional bonding from the π-system and so it is not surprising that its bond length is shorter and the stretching vibration higher than Be22+. Here are two more permutations. Rather than removing two electrons from Be2, we add two. These again go into the π-orbitals and like the neutral Be2 we must form a triplet state, which has a bond length of 2.242Å and ν 386 cm-1. 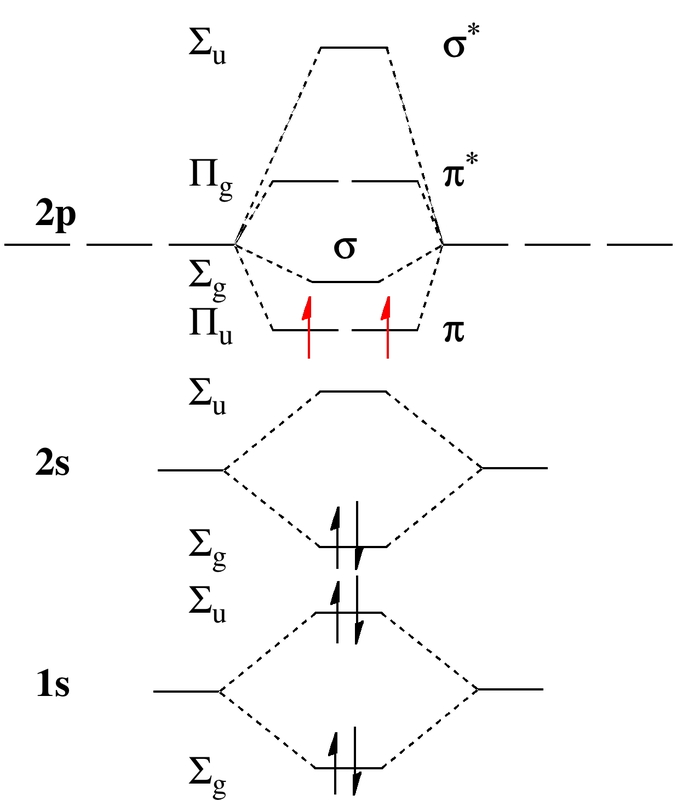 By double excitation one can get a state with double occupancy of both π-orbitals. This has an even higher bond order, but ν is only 869 cm-1. Here we see the relationship between ν and bond length breaking down (Badger’s rule). Perhaps as a pedagogic exercise in manipulating bond orders and their relationship to bond lengths with electrons, this might be a useful exercise. Be2 in the bonding π orbital rather than the antibonding σ orbital can increase the bond order to three. It is a simple extension to do the same to neutral B2. This calculation can be inspected at doi: 10.14469/hpc/3083. The B-B length is 1.356Å, ν 1659 cm-1 and Wiberg bond order 3.01. Four crystal structures reporting B≡B bonds have lengths from 1.45-1.52Å, but these all have 4 valence electron pairs in boron, one of which occupies the σ* orbital. Moving on now from the doubly excited state of diboron, we have the equivalent doubly excited state of dicarbon (2+) (doi: 10.14469/hpc/3085). This has a C≡C bond length of 1.162Å, ν 2381 cm-1 and a Wiberg index of 3.00.